I was never a huge fan of the Hitman games on console. I tried to play Hitman 2, didn’t get very far. I just found it too tense and it didn’t suit my preferred way of playing – which is just to get on with it and start a fire-fight. I was never one for just creeping around the shadows and holding my breath for ages to see if I got discovered. Not to mention the myriad of systems and occasions when I was detected with absolutely no idea why (in disguise, walking normally, no weapons out – what’s the problem?!). I’ve had Hitman Absolution on my PS3 hard drive for a long time and still haven’t really made any effor to engage with it. It’s safe to say it’s not my kind of game. I’d heard from a few different quarters how good Hitman Go! (an adaptation for mobile made by a small studio within Square Enix in Unity) was and it didn’t really matter what you though of the original – it was still worth playing. So I investigated. 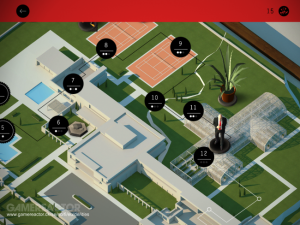 Hitman Go! is what happens when you ask someone to reimagine Hitman as a turn-based grid-movement puzzle game with visuals that kind of remind me of the old football board game of Subutteo. The only controls you use are swipe controls to go up, down, left and right. There are no action controls at all. This works surprisingly well. There is a limited map of nodes and grid lines that connect them which restrict your movement, and this board is set amongst some nicely rendered scenery that feels like a cross between a boardgame and a dolls house. Moving, or looking around, the same board are a series of different guard types with different behaviours – some just move constantly and attack you when they move into the same space, some only attack you if they see you. There are also your other ‘Hitman staples’ such as keys to open specific doors (not that they’re peculiar to Hitman, but still!) disguises to put on to get past certain enemies and manhole covers to shortcut from one location to another. The game introduces a few more functions after that, but not many and not any that are very complex. 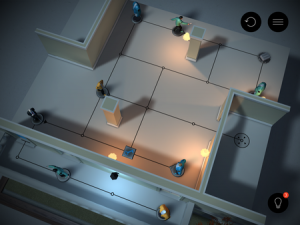 Out of this ultra-stripped down simplicity though, Hitman Go! still manages to feel very much like a Hitman game. It’s an amazing piece of design that manages to completely change the game, and yet still retain the core parts of the identity of the original. The basic actions of the game are still there (kill guard, sneak past another, wear a disguise to get past certain people, attempt to complete a level without killing anyone etc.) but wrapped up in an ultra-simple interface and a small but carefully curated set of game systems which never bamboozle with options but allow real depth and variety. It honestly would be really good to see more mobile adaptations of console IP done this well – where there’s been careful thought put into what really identifies the series as unique, and then adapting that to what’s most appropriate for the platform (in this case simple swipes on a touch screen). In addition to Hitman Go!, SquareEnix also followed up the critical acclaim with Lara Croft Go! which apparently builds on the same foundational strengths but without just being a reskin of Hitman Go!. I’ve got the Lara Croft one but have yet to play it, but look forward to doing so. It’s interesting to see what other adaptations this inspires though – there are many IPs that could benefit from this ‘reimagining as a board game’ kind of exercise. If Hitman can do it, it’s not exactly a big step to imagine SquareEnix putting out an Assassin’s Creed Go! or Deus Ex Go! in the near future, not to mention any other triple-A IPs that other companies produce…Gears of War Go!? The Walking Dead…Gone! anyone?